Mom, Incorporated is a holistic, realistic guide to starting and growing a business with a baby or small children in your midst. Written by popular social media personalities Danielle Smith and Aliza Sherman and featuring 88 women from across the country and Canada sharing stories and advice about home-based businesses and the work/life juggle. Forget about balance! It’s all about the JUGGLE! See What People Are Saying About Mom, Incorporated! “Mom, Incorporated serves up a wealth of knowledge; not only does the book cover the broad strokes, it also zooms in on smaller details like securing a domain name and crunching numbers,” ForWard says. It concludes: “After flipping through pages of such tried-and-true knowledge, the reader is left with a sense of empowerment to accomplish what might once have seemed impossible.” Read the whole review. “Sherman (The Complete Idiot’s Guide to Crowdsourcing) and Smith (founder, extraordinarymommy.com) provide the nuts and bolts for parents wanting to start a home-based service- or product-oriented business. They introduce the KISS principle—Keep it Simple, Sister!—and include handy planning worksheets throughout (also available for download via MomIncorporated.com).” Read the whole review. I wish I had had MOM, Incorporated to help me get started. Aliza Sherman and Danielle Smith do a wonderful job of helping you come up with a plan, and then put it into action. 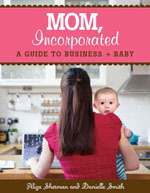 MOM, Incorporated is, first and foremost, a book about starting your own business. But it’s geared toward women (and men) who have families and aren’t willing to ignore them to get ahead. Read the whole review. I worked at a crazy ad agency job for 4 years. After I had my daughter, I left my job for a new ad agency job, hoping it would make for a better “work/life balance.” But it was WAY worse. I was fired from the new ad agency in mid-October 2011 in an episode that occurred after I took my daughter to a doctor appointment. I’d worked there for six months and hadn’t even used half of my meager allotment of personal time. When I arrived back at work after the appointment I was notified that my employer had “made a mistake” when he hired me and another working mom new to the agency. The mistake? We weren’t ever supposed to have the amount of personal time we’d been given — so he revoked our vacation time to make up for it. When I asked for the new policy in writing my boss became extremely defensive, literally screaming at me and threatening me. After the 15th time he called me “hon” I asked him not to patronize me. And, suddenly, I, the girl who was always the overachiever, had no job. That experience really put things into perspective. My husband and I became aware of how off-balance everything in our life was with both of us working conventional jobs full time and having a baby. And we wanted one more child — but didn’t know how we could ever do that with my crazy work schedule. A week later, my husband and I decided it was time for me to try my hand at self-employment. I already had one client, and knew I could build a better life for myself and my family if I could pull of starting my own business. Two weeks later, we found out I was pregnant. I am now six months pregnant, love the work I’ve been doing, and business is really starting to pick up. Oh, and I am exhausted all the time and on an emotional roller coaster! 80% of the time I can’t believe I get to do what I do. 20% I want to cry and bang my head on the table (and sometimes I do – hormones, I blame hormones). My husband and I have had a rough and busy couple of weeks. In the midst of it all, last week I got a new client. One I’d been wanting. And then this afternoon, I got two more new clients. I was simultaneously high-flying and superstressed and decided when my husband got home that I needed to head to the bookstore to get some time to breathe and clear my head. After perusing the business section for more than 20 minutes, my eyes fell upon your book. I don’t think I even read the back of it. I grabbed it, went home, climbed in bed and started reading. Already, this book has been SO HELPFUL TO ME. In just the first few chapters, I read personal accounts from mom entrepreneurs that perfectly described what I’m going through. It made me feel so much better to know that my frustrations are all part of the process and I’m not a failure for feeling the way I do sometimes. Beyond this, though, the book is providing extremely practical info I will need as I proceed and grow my business.